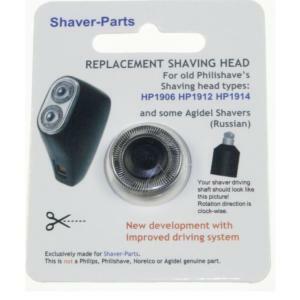 • Tête de rasoir Shaver-Parts de remplacement Philips HP1912 . Cette article est vendu avec 1 tête. • Compatible avec les rasoirs Philips: HP1117, HP1118, HP1119, HP1121, HP1122, HP1123, HP1124, HP1125, HP1126, HP1128, HP1129, HP1130, HP1131, HP1132, HP1133F, HP1134, HP1135, HP1138, HP1142, HP1203, HP1205, HP1207, HP1208, HP1212, HP1213, HP1214, HP1215, HP1216, HP1217, HP1304, HP1305, HP1306, HP1308, HP1309, HP1310, HP1311, HP1312, HP1313, HP1320, HP1615, HP1620, HP1621, HP1630, HP1631, HP1906, HP1912, HP1914.